We've only got a few updates for you today...and some "short ones", at that! Life goes on in Hyderabad. Today (Monday) is Amy Suzanne's day off, so - we're definitely heading over to Mocha in Banjara Hills for some eye-opening coffee and a little bit of breakfast. They have something called the "Sri Lankan Omelet" that is to die for! Eggs, sweet onions, bell peppers and little hot red chiles! For every-day visits, we still prefer Beyond Coffee in Jubilee Hills, but "Mocha" has just enough of a funky, Bohemian atmosphere to get the new week kicked-off in style! Dateline: Banjara Hills. Last night, as we were leaving for dinner over at N. Grill - our new Skoda Laura got hit (It was parked, thank God! I never want to experience a real traffic accident here!) right in front of our house! Actually, right in front of both of us - as we were standing less than 5-feet from the rear bumper that got hit! A younger man from the neighborhood (I ended up feeling badly for him...but it was a pretty stupid move!) was trying to make a "three-point" u-turn, and he whipped his car into "reverse" without really looking, and backed-up hard, and caved-in our rear bumper pretty good! (I'm surprised that this kind of thing doesn't happen here every five-seconds in this wild traffic scene!!) The Skoda's bumper did its job, and popped right back out, but there was more than just a "paint transfer" - there was a pretty deep scratch in the actual rubber/plastic (whatever!) of the bumper. We kindly decided to let the kid's friend at a local body shop fix it...and - if the repair passes the inspection of our leasing agent from Skoda - then no-harm done! By the way, N. Grill was incredible, once again! Dateline: Gandipet Lake Area. We had the most wonderful experience last Saturday. 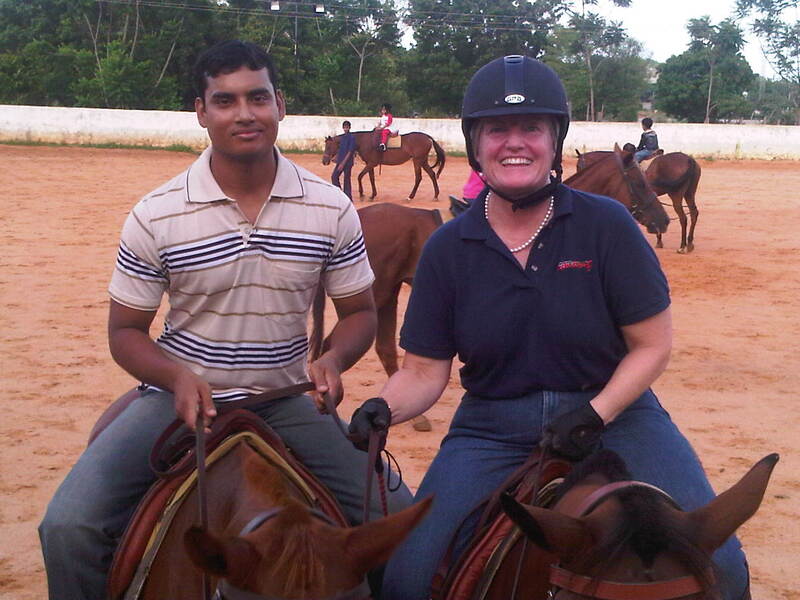 Suzanne has been quite regular in her weekly visits out to the Hyderabad Polo and Riding Club. Krishna loads her helmet and her boots into the trunk of our car...and right after work on Friday and Saturday, they make their way out toward Gandipet (it's really quite lovely out there...the riding club is in the same general area as a large "deer sanctuary" and it's pretty rustic for being so close to town!). For a few weeks now, our yoga instructor, Neeraj, has been asking more and more questions about Amy's riding. He loves the pictures that we have on our refrigerator door of her jumping and showing horses. So, we picked him up at the gas station (which we now refer to as "the petrol pump"!) near his apartment in Madhapur, and we went out to see how he'd do. Dateline: Secunderabad. This last Sunday, I decided it would be a good thing to do to take Krishna to the Telugu language Mass at St. Mary's in Secunderabad. As we got into the car for the 15-minute drive, we asked Sangamesh (our all-nighter security man!) if he might like to go to church, too. He said "yes" - and got into the back seat. He told me right off (Sangamesh's English is not as good as Krishna's, which is improving every day!) that he would not be going inside the church as he said that it was along, humid night, and that he was "not fresh". I wanted to laugh and tell him that there were a lot of "not fresh" people in church, and that it was O.K.!! But then, as we were pulling into the church driveway, Sangamesh said that he was fine standing outside in the parking lot...where it would be just "(him) and (his) God." He smiled when he said it. THAT I clearly understood. I just smiled back at him and gave him a big hug (not very common here!) and Krishna and I went inside. The Mass had just started, and the processional hymn was very Indian-sounding. Quite a lot different than the English language Mass music, although neither kind is even remotely singable. "Why Can't Catholics Sing"? Come to one of these Masses and you will hear what I mean!! Of course, I understood nothing, but - having a passing understanding of the Catholic Novus Ordo liturgy, I could certainly tell where they were at all times during the Mass. Telugu is spoken very fast...kind of like how Cubanos speak Spanish. The sermon...? Well, frankly, it was waaay too long. I don't care what language you are speaking...25-minutes is just too long. I wanted to stand up and say, "Father...you're losing your audience here!!" People were nodding-off!! There was one guy across the aisle from us who was was texting...and THEN he nodded-off!! After the Mass, I asked Krishna what the sermon was about. "What was it about, Krishna? What did the pujari say? ("Pujari" is the word used to address a Hindu priest!) Krishna filled me in...he said that it was all about politics, last Tuesday's mid-term elections and politicians!! I told Krishna that this was not a good thing. He understood, and knew almost instinctively. Krishna told me that Father did say at one point in his terminally-long homily, that "Mataji Teresa" was very, very good. I said "Amen!" We found our car (with Sangamesh still standing his post!) and left for home. I don't believe we'll be going to the Telugu Mass anymore. I had forgotten how much meaning the Readings from the Scriptures give to the Mass. I received my obligatory Communion, but I somehow felt like a tire that was under-inflated at the beginning of a road-trip. I must admit, I missed hearing the Gospel read in my vernacular! !